Brilliant Classics avvia la distribuzione del nuovo CD dedicato alla musica di Leo Brouwer (1939) nell'interpretazione di Frédéric Zigante. forms the basis for an Afro-Cuban flavoured fantasy. 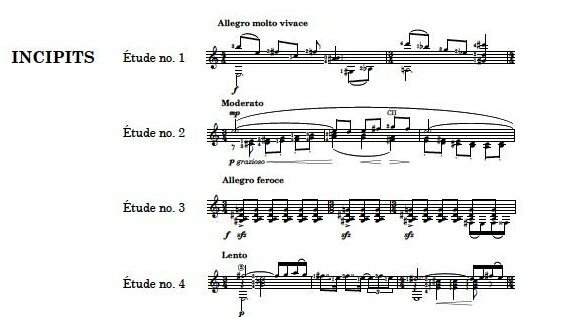 The Fugue No.1 dates from the following year, when Brouwer was still a teenager: having outlined a theme of Baroque proportions he takes a fairly free attitude to its contrapuntal elaboration, anticipating the concise play of fantasy in the Tres Apuntes of 1959. Having soon after moved to the US, Brouwer composed the first two books of the Estudios sencillos out of financial necessity, but they have proved among his most enduring and successful works, drawing energy not only from his Cuban heritage but the didactic economy of the Mikrokosmos by Bartók. Almost all of the third and fourth books from the series date from 1981; although Brouwer had both moved back to Cuba by then as well as moved on in his own style towards a more neo-romantic language, he rediscovered the lively economy of thought which runs through the earlier studies, combining it with both neoclassical harmonies and even chance procedures to produce among the most significant collections of guitar studies from the second half of the last century. 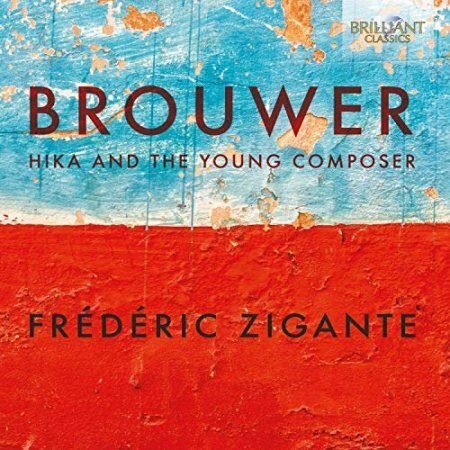 ‘These short pieces reflect all of Brouwer’s creative genius,’ says Frédéric Zigante, ‘and I have always been fond of them, first as a young student of guitar and later as a guitar teacher. To me, they are an ideal method for weaning young guitarists from the didactic repertory of the 19th century.’ The French-born guitarist bases his career in northern Italy, but he has performed and recorded worldwide, as well as editing more than 40 volumes of guitar music for publishers such as Ricordi and Max Eschig. Leo Brouwer (1939) is by far Cuba’s best known composer. A composer, guitarist, percussionist, conductor, teacher and cultural promotor he is one of the most important and influential musical figures of Latin-America. 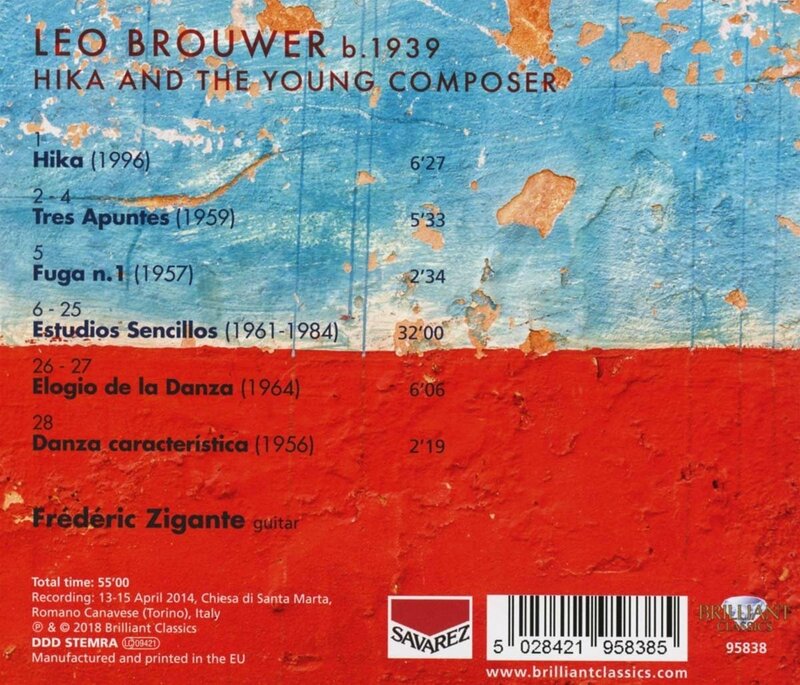 Brouwer’s grandfather was a Franco-Dutch adventurer, while his mother’s uncle was the famous composer Ernesto Lecuona. Brouwer studied at the prestigious Juilliard School in New York with Persichetti and Stefan Wolpe. In 1961 he returned to his native Cuba, to become a professional guitarist and composer. His works have entered the standard repertoire of the modern guitarist, played and enjoyed all over the world. This new recording includes the Hika, a piece written in memoriam Toru Takemitsu, a close friend of his. 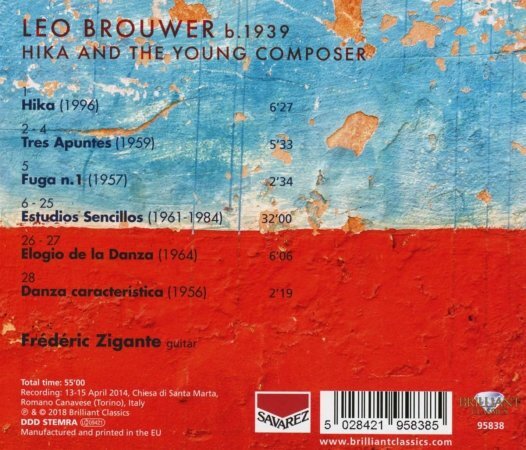 The other works are from Brouwer’s “early period”: the complete “20 Estudios Sencillos” (a Latin-American answer to Bartók’s Mikrokosmos), a Danza Caracteristca, Elogio de la Danza, and Tres Apuntes, all written in Brouwer’s unique fusion of Folk Music and 20th century Avant-Garde. Excellent performance by master guitarist Frédéric Zigante, who recorded for Brilliant Classics the complete guitar music by Villa-Lobos.